North Korean leader Kim Jong-un's surprise visit to China appears to be aimed at maximizing his negotiating leverage ahead of a second summit meeting with US President Donald Trump, experts said Tuesday. A special train carrying Kim arrived in Beijing on Tuesday. North Korean state media reported earlier in the day that Kim and his wife, Ri Sol-ju, left for China on Monday for a four-day trip at the invitation of Chinese President Xi Jinping. It is Kim's fourth trip to the neighboring ally and came as the United States and the North are negotiating to set the venue for a Kim-Trump summit. His entourage included top officials, such as Kim Yong-chol, a key nuclear negotiator with the US, and Ri Yong-ho and No Kwang-chol, the country's foreign and defense ministers, respectively. Experts said the visit could indicate that a Kim-Trump meeting might be imminent. Last year, Kim traveled to China and met with Xi three times before and after he held his first-ever summit with Trump in June in Singapore. "The visit is aimed at coordinating strategic interests between North Korea and China ahead of the second US-North Korea summit,"
said Kim Han-kwon, a professor at the Korea National Diplomatic Academy. "By strengthening strategic cooperation, the North is apparently trying to maximize its bargaining power in its negotiations with the US"
Kang Jun-young, a professor at Seoul's Hankuk University of Foreign Studies, also said that Kim's trip is aimed at increasing his negotiating leverage by showing his closeness to China while making sure that Beijing will continue to be on Pyongyang's side even if talks with Trump go wrong. Trump and Kim held their first historic summit in Singapore in June and agreed to work toward the complete denuclearization of the Korean Peninsula in exchange for security guarantees, but little progress has since been made. Pyongyang wants sanctions relief in exchange for denuclearization measures it has taken so far, but Washington maintains that such concessions would not be granted until the North completely gives up its nuclear weapons. Kim warned in his New Year's Day address that he could seek a "new way" if US insists on sanctions. "The main agenda of the visit will be the US-North Korea summit," said Park Jong-chul, a researcher at the Korea Institute for National Unification. "It appears Kim is trying to ... seek China's advice" on the forthcoming summit with Trump, the expert said. North Korea has been increasingly emphasizing China's role in resolving the deadlocked situation on the Korean Peninsula, with leader Kim proposing "multi-party" negotiations to replace the current cease-fire agreement in the New Year's speech. "As was expressed in the New Year's speech, the best plan for North Korea would be making a big deal with the US, but the North seems to be preparing for alternatives in case it does not work out," said professor Kim Joon-hyung at Seoul's Handong Global University. Park of the KINU said that Kim's trip would be a very satisfactory event for Xi because it will elevate China's position regarding the Korean Peninsula's peace and security. Xi could unveil a number of "gifts" for Kim in return, such as economic help, the expert said. 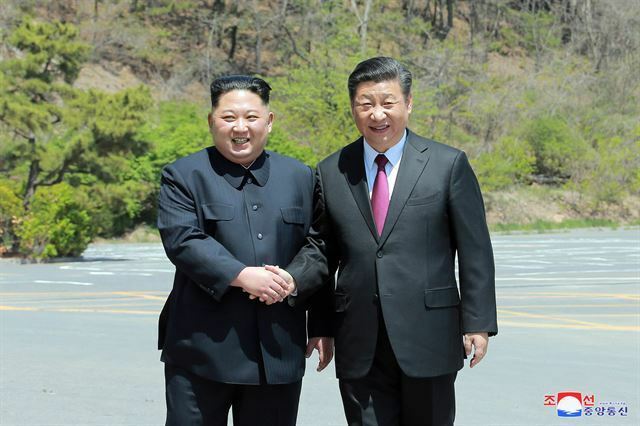 Xi is also expected to visit North Korea this year as the two countries mark the 70th anniversary of establishing diplomatic ties. "While the sanctions will continue to remain in place, they won't get more tight unless North Korea launches new provocations,"